Knowing God's long term historical plan makes the Bible understandable. The pageant of history can be plotted along a time-line. The path cycles from negative energy periods to positive ones. Negative energy produces a finite, material kingdom called "World." Positive energy produces a more-spiritual reality on this planet, called kingdom of God, or "Heaven." One long-term cycle of history is shown here as 24,000 years, which is one precession-of-equinoxes, which is the time it takes for our sun to make one apparent circuit through the constellations of the ecliptic plane. Any type of cycle can be diagrammed on a sine-wave curve in which half is negative and half positive, just as one daily cycle has half night and half daytime. The negative half-cycle (below the line) is a period of negative energy, during which time and space constructs are linear and finite, which means that our perception of reality is limited to physical and natural laws of time and space. During the negative period, which is the kingdom of World, we perceive ourselves as limited physical bodies with a faulty human nature. We perceive ourselves as souls struggling through the darkness, seeking a lightness which is only known to us intuitively. It is the kingdom heaven for which we yearn, and that is the half-cycle of history above the horizontal line, a period of time when the Lord of Light rules. During kingdom of World, the lord of darkness, Satan, rules. 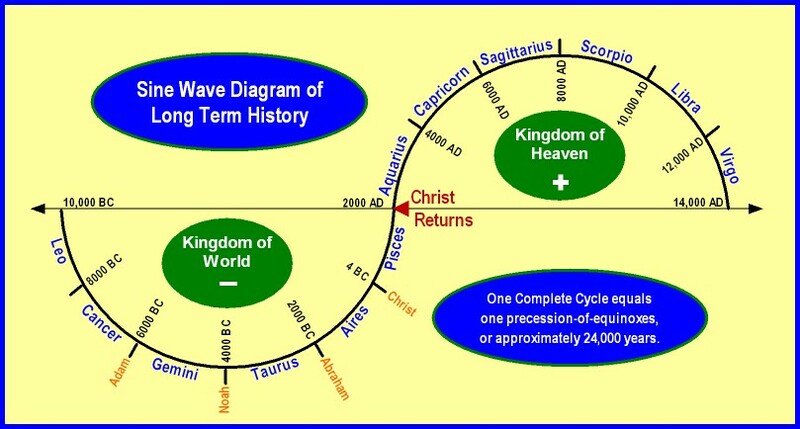 Right now, around the year 2,000 AD (perhaps 2012), we are about to ascend from kingdom of World to kingdom of God. The kingdom of God is the next period of history, about 12,000 years of positive energy, ruled by Christ. The transfer of power from Satan to Christ will be sudden and catastrophic for the World. It will be a violent end of our material civilization, with a reversal in the earth's magnetic-field polarity. A hiker's compass will suddenly point south instead of north. With that reversal, the planet will wobble for a few days (weeks?) and restabilize on a slightly different rotational axis, perhaps as much as fifteen degrees different from the present axis. When the earth wobbles, tectonic plates will shift, terrible earthquakes will change landscapes, tidal waves will inundate coastlines for hundreds of miles, and volcanic ash will fill the skies. Perhaps more than half of earth's population will perish. While the zodiac symbols do signify the twelve ages of a cycle, this is not the pseudo-science of astrology. 12 zodiac ages define 12 periods of God's divine plan. We are at the end of Pisces, the fish, an age which Jesus inaugurated by "fishing for the elect." He came to seek and save the Israelites who had breached the Old Covenant (contract). Jesus was born at the end of Aries, the Lamb, as the "Lamb of God" offered in sacrifice. Abram was born at the beginning of Aries, when he instituted a religion which venerated the Lamb on the altar, instead of the Bull (or Calf) which was appropriate in the previous age of Taurus. At the beginning of Taurus, about six-thousand years ago, was the nadir (bottom) of the negative half-cycle, at which time the great Flood of Noah occurred, wiping out all God's Adamic race who had mixed their race with neighboring races. The flood wiped the board clean, and gave the Adamic race a new start, with a destiny to influence the world and stimulate progress on the return path as a prodigal toward God. Prior to the age of Taurus was Gemini, "heavenly twins." While I had long thought Adam and Eve to be those "twins," I now believe the twins were Cain and Abel, indicating the start of the grand contest between good and evil. Cain would father an evil race of descendants who would instinctively war against the descendants of Adam and his son Seth. For a detailed discussion of this, see my article titled Paganism. Anyway, you can see how the zodiac symbols define each age or epoch, and how civilization declines and progresses in cyclic patterns. Just a note here: each zodiac age can also be diagrammed on another sine-wave curve, and you will see sub-cycles of declines and progress of historical events. This brief overview is merely to give you an idea of the theme and plot of God's Grand Pageant. One cycle is a model or historical paradigm which repeats itself within its sub-cycles, such as within each of the twelve age cycles of one complete cycle. The diagram below says "25,000 years," but should say "24,000." I would be glad to mail you a more comprehensive diagram of long-term history if you CONTACT: Roger Hathaway, 1125 Goldfinch Lane, Jewell Ridge, Virginia 24622 (I will be decreasing the time on computer, so I prefer correspondence via postal mail) as long as I have them available. The twelve tribes of Israel correspond as follows: Leo/Juda, Cancer/Issachar, Gemini/Zabulon, Taurus/Ruben, Aries/Symeon, Pisces/Gad, Aquarius/Ephraim, Capricorn/Manasse, Sagittarius/Benjamin, Scorpio/Dan, Libra/Aser, Virgo/Nephthali. More information about the correspondence of zodiac ages with Israel 12 twelve tribes is at God's Kosmos.